Do NOT distribute images for commercial purpose. Total Access Since Dec 7: Times. Complete new design, 112 Harbin in service. 5300-ton, 150-meter long, fitted with 4 twin C-802 antiship missile launchers, 1 octuple Crotale anti-air missile system, 1 twin 100-mm guns, 4 twin 37-mm guns, 2 triple anti-sub torpedo tubes, 2 12-tubed anti-sub rocket launchers, hanger for 2 Z-9 helicopters. 106 Xian : Belong to North Sea Fleet. Oringinal design, though variations exist besides major ones list seperately. Those variations include AA guns and radars. 107-110, 131-134, 161-165 are in this class. Full load 3670 tons, 132M long, speed 32 knots. Weapons: 2 triple HY-2 anti-ship missle launchers, 2 twin 130mm main guns, 4 twin 37mm or 57mm guns, 4 twin 25mm guns, 2 12-tubed anti-submarine rocket launchers. 105 Jinan : North Sea Fleet, modified to carry 2 Harbin Z-9A Dauphin helicopters. Stern 130mm and 37mm guns were removed in order to accommodate the flight deck and hanger. The only one in this type. 109 Kaifeng : North Sea Fleet, stern 37mm guns were replaced by an octuple Crotale anti-air missle launcher. Also fitted with new radar. Only one. 166 Juhai : South Sea Fleet, has 4 twin C801 Missles launcher; new twin 37mm guns; new electronics. There is a Jiangwei Class Frigate (540 Huinan) in the background. Picture taken when Chinese Navy was visiting Vladivostok, Russia in May 94. 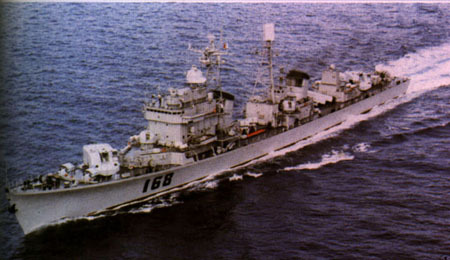 Numbered 168 while participating International Navy Week in Indonesia.